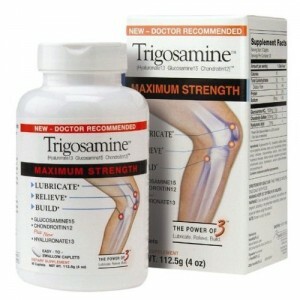 Trigosamine is a joint supplement from PatentHealth. There are two formulations available: Fast-Acting and Maximum Strength. We’ve examined the maximum strength formula. Trigosamine has 3 of the 9 ingredients we were looking for. It has 1500mg of glucosamine HCl, 1200mg of chondroitin sulfate, and 13mg of hyaluronic acid. Trigosamine uses titanium dioxide coloring. 1.5 stars out of 5. Glucosamine Uses 1500mg of glucosamine hydrochloride. Glucosamine is a precursor to glycosaminoglycans which are a major component of joint cartilage. Hyaluronic Acid Has only 13mg of hyaluronic acid, a low amount. Hyaluronic acid is a vital fluid found in the synovial (joint-lubricating) fluid. am totally confused on the supplement trigosamine, Is it safe or not, does it really work? I have been trying it for a couple of weeks now and I will say that it does not work any better and for me worse than other types of joint supplements you can purchase. There are ingrediants, though some are not disclosed, that are proven dangerous to your health. After learning more about the drug, I will no longer take it and question the reliability of the testing done in clinical trials! Does it help? is a good question. It helped me, twice. Once for my shoulder and Second, for my knee. Sometime ago there was an article on the newpaper with information on the studies performed on this product and showed promising results. I had torned cuff rotator (MRI should damaged),but not detached. Physician recommended surgery, took product for the first two months and showed improvement, and with physical therapy was back to normal within three to four months. Second recieved extensive damage to my knee, probably both, hower only one was MRI scanned. Again I had torned ligaments, not detached. In two wo months was back to normal, no pain. I take this product daily, one bill a day. I’m 60 years old. I believe this product protects and repairs joints…. Did trigosamine have more hyoloronic acid a few years back. I think so!! I loved the Fast Acting formula but since Max Strength came out cant seem find it. Too much hyoloronic / sodium in the max strength which causes swelling for me.